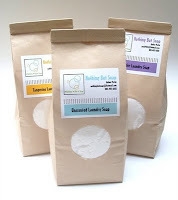 The winner of the Nothing But Soap natural laundry soap giveaway is: Heaventaste! Thank you to all who participated. If you are like my sister, now that you know you didn't win, you can go ahead and make your purchase from Nothing But Soap. Amber has great prices! And if you haven't done so already, remember to enter the giveaway for a set of stainless steel straws made by Etsy shop The Mulled Mind. There will be 2 more Etsy giveaways in June as well. Stay tuned!